CQ WW volunteers have been analyzing some of the CQ WW 2015 SSB signals. This article presents some observations on SSB signal quality based the type of signal analysis that is possible using the SDR recordings made by the CQ WW Contest Committee and how poor quality signals can be detected and measured. An ideal SSB signal shows a spectrum of about 70 Hz to 2700 Hz that is rather flat in strength throughout the passband. The theoretical ideal SSB signal does not contain any energy outside of the passband. All energy is concentrated at providing the best possible reception for the receiving station. In reality, a typical signal has some energy outside the passband as the transmitter’s amplifier stages generate distortion energy, of which the most meaningful part is called intermodulation distortion, IMD. The best signals do not contain too much energy above about 2500 Hz, as most receivers used by contesters employ about 2.4 kHz to 2.1 kHz wide or just 1.8 kHz wide filtering for sideband reception. Any energy outside that bandwidth is practically wasted energy and does not add to signal’s readability. That excess energy mainly disturbs the others on the band. An example of this distribution of signal energy is shown in Motorola document EB38 written by Helge Granberg (OH2ZE / K7ES). The document describes the behavior of a real-life SSB amplifier for the engineering minded. 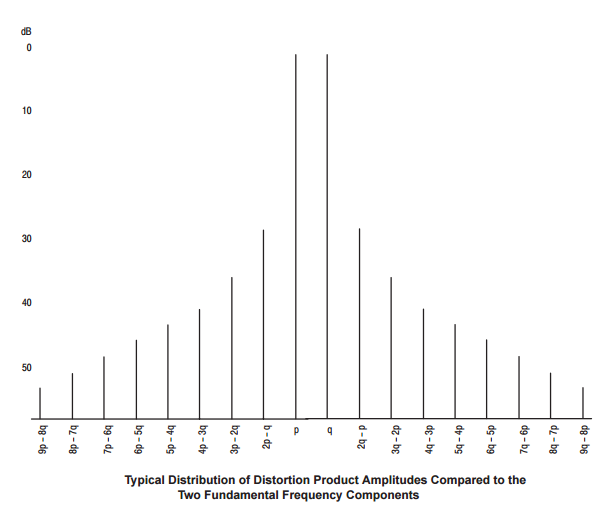 What is meaningful to us contesters, is that the intermodulation products should show energy of about, or preferably less than, -35 dB of the pass band energy level when the intermodulation distortion (IMD) level is measured at 4000 Hz from the frequency readout of the transmitting radio. The signal shown below in Figure 2 is nearly ideal. The pass band is clear and relatively flat. The transition to the non-pass band is clear and the distortion products are very low. In this case, the pass band starts just below 300 Hz and ends at about 2650 Hz. A result of 39 dB below the pass band at 4 kHz is very good! A signal fulfilling these specification criteria can be considered a benchmark signal. The next two examples show a common situation where the signal quality changes when the operator is using recorded audio and microphone audio. In figure 3, the station is transmitting using the speech memory. 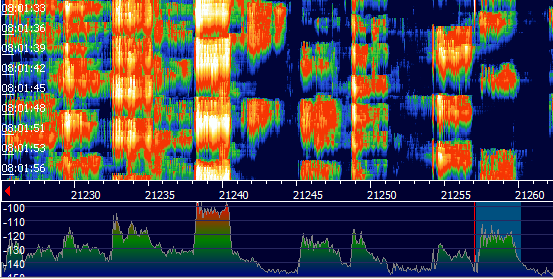 This station shows a pass band of more than 3000 Hz and better than 40 dB IMD at 4000Hz. In figure 3a, the operator is using audio from the microphone. When listening and comparing these two, the spoken audio is noticeably less smooth. The spoken signal sideband is clearly audible more than 15 kHz away from the center frequency on a virtually empty 10 m band. The speech memory audio was not as noticeable at that same separation. The level is about 8 dB below the first sample (there was some QSB). Both of these signal samples are well within the acceptable SSB signal criteria, as contesters want to hear on the bands. In the second example, the station owner could easily improve his signal readability by turning down the mic gain and/or processor for his own spoken audio. The difference would probably be audible through the radio’s monitor. It should be noted that both above stations use new radios with DSP equalization for the transmitted audio. The second station could be a little more efficient if he would waste less of his 1500 watts outside the needed passband above 2300 Hz or so. Also the station of the first example might improve his pass band signal readability a little by focusing the energy better to less than 2300 Hz passband width. Here is an example of an analog technology station. It has a good audio equalization and a very clean output regarding the distortion energy. The output has the main part of the passband energy below 2500 Hz with narrow transition band and very low distortion level. None of the examples above are over-driving their transmitters. The example below shows a relatively flat passband but misses some of the energy at the lower frequencies, below 550 Hz. It decreases readability. The edge of the passband is not very clear and the distortion products are relatively close to the passband signal level. This signal is clearly over-driven. Any energy the transmitter sends, outside that ideal passband, is cut off by the receiver filters. As the receiver accepts only signals within the passband, the transmitter's wider energy outside the passband is wasted. Thus, the actual resulting signal at the receiver is weaker than it would be with correct focusing the energy within the correct passband. In this case, the IMD level is only about 27 dB under the passband level at 4000 Hz separation. The signal clearly spreads out much more without attenuating enough to give fellow contesters the room on the band. Here we see the on-band spectrum view of this same signal. The signal reaches -30dB at about 6000 Hz from the actual frequency. This signal is unacceptably wide. This station over-drives the transmitter and the USB signal spreads clearly up and down. If this signal would be at about same strength as the others on the band, the distortion products would be difficult to measure. On an empty band, this station would splatter several tens of kilohertz. In this case, as the band is rather busy, the station is noticed only because he is stronger than the others near his frequency. Here is an example of a clear over-driving signal. This station has a peak in the lower audio frequencies, which is not helping the readability. It has a -10 dB bandwidth less than 3000 Hz, which is a good number. But the -30 dB bandwidth is over 10 kHz. This kind of spectrum usage is not at all considerate regarding the fellow contesters. At more than 6 kHz separation the distortion energy level should be at least -40 dB compared to the pass band signal, preferably more. As seen in figure 6, the overly distortion results in a spectrum that spreads up and down from the pass band. It is because of the nature of the clipping and distortion. The clipping produces radio signal components above and below the actual frequency at unnecessarily high energy level. If a station exhibited this type of signal over the course of the contest or generated complaints from participants, it could be subject to disqualification. A reasonable criteria for a poor quality SSB signal is one that has a width greater than 6kHz at 40db down. The goal of this article, and of the CQ WW rules regarding signal quality, is to help make contesting more enjoyable and provide more room on the bands. This is a real view of 15 meters captured during CQ WW 2015 SSB. There are many stations that have very good and clean signals. Those are provided by correctly tuned transceivers, amplifiers and well-engineered power supplies capable of delivering the energy the equipment need.